Release Date: July 7th, 2006 by Warner Independent Pictures. The Cast: Keanu Reeves, Robert Downey Jr., Woody Harrelson, Winona Ryder, Rory Cochrane. Directed by Richard Linklater. BASIC PREMISE: Bob Arcter (Reeves), a drug-addicted, undercover narcotics cop, goes through bizarre experiences when he must spy on his druggie friends to hunt down the supplier of a powerful drug called Substance D.
ENTERTAINMENT VALUE: Shot in live action and then animated through the process of rotoscope, A Scanner Darkly has plenty of lively visuals, but not enough of a coherent or a surprising plot to be engaging. The complicated plot involves the government hiring Fred to find the main supplier of Substance D, who may or may not be linked to Bob Arcter. It turns out that Fred is actually Bob Arcter and his friends, so Bob essentially must spy on not only his friends but himself. How was Bob able to pretend to be Fred? Basically, all of the narcotics officers mask their physical identity by rapidly changing into many different people. Bob’s druggie friends include Barris (Downey Jr.), Fric (Harrelson) and Donna (Ryder). Fric provides for most of the dry, off-beat humor thanks to Harrelson’s great comic performance. Much of the film feels like a similar mind trip to writer/director Richard Linklater’s last film, Waking Life, which had less of a plot and more philosophical banter. Both films have richly-textured visuals and musical scores. 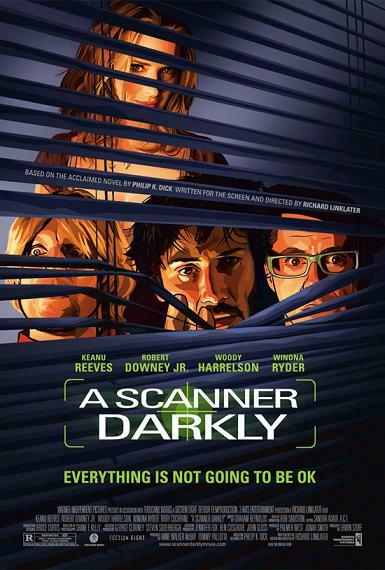 Unfortunately, A Scanner Darkly doesn’t have any memorable lines or scenes and its complex plot goes overboard with bizarreness which diminishes any tension and induces headaches. More humor would have helped to make this mind-trip more entertaining rather than confusing and often dull. INSULT TO YOUR INTELLIGENCE: Too confusing, bizarre plot with not enough tension. IN A NUTSHELL: A visual mind-trip. However, often too bizarre, confusing and unsurprising.